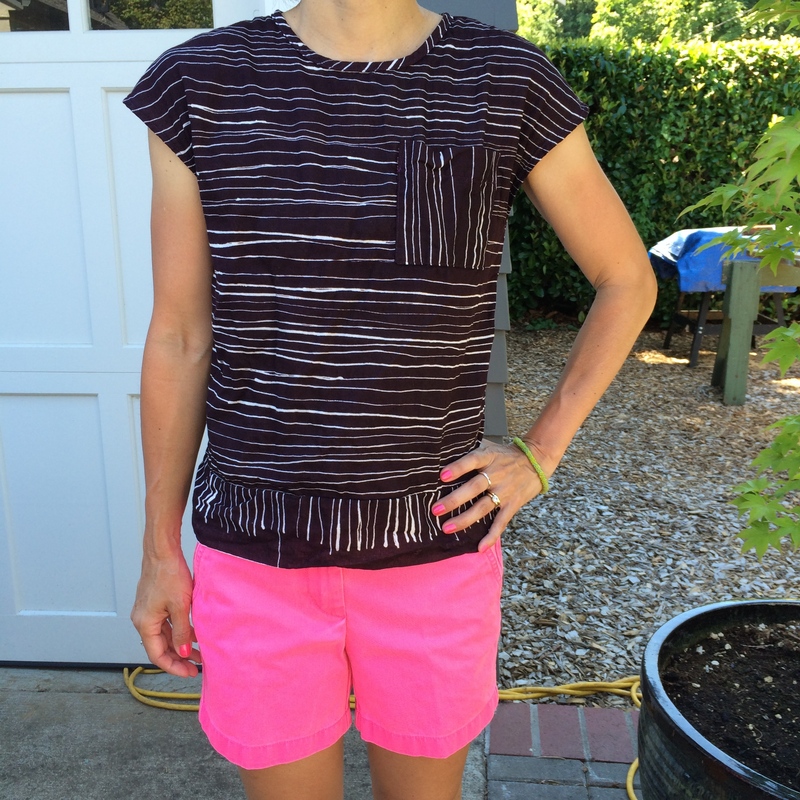 I made a couple of summer tops! These are easy to make and use only a yard of fabric, so it is definitely a win-win situation. The dot fabric was sent by Yoshimi when we did a little swap last year. It has a little bit of stretch to it and is very Japanese-y, I think. The pattern is a mish-mash of various patterns I have. I wanted French sleeves and an easy pullover design. The neck kind of gaped and hung open in an odd manner, so I put in a little tuck in front, and now it is fine. I revised the pattern I used for the dots to address the gaping neck issue, and I think it fits just right now. Last fall when we went to Japan, I went to the nani iro mothership in Osaka. It was amazing, but I could not take any photos because it is NOT ALLOWED, plus the clerk gal was a little scary. Anyway, I did not buy much fabric, just this piece and another in the same motif but in a hot pink. I LOVE THIS FABRIC. I got one meter of each. Unfortunately, the fabric was a smidge too narrow to fully cooperate with the pattern, so I had to get creative (see the bottom of the shirt. One bonus was I didn’t have to hem!). I haven’t decided whether I should make this same shirt in the hot pink or if I should find something else to make. What do you think? The vertical patterned pocket and bottom looks fantastic! Make this shirt in pink, for sure!! Both look lovely on you! 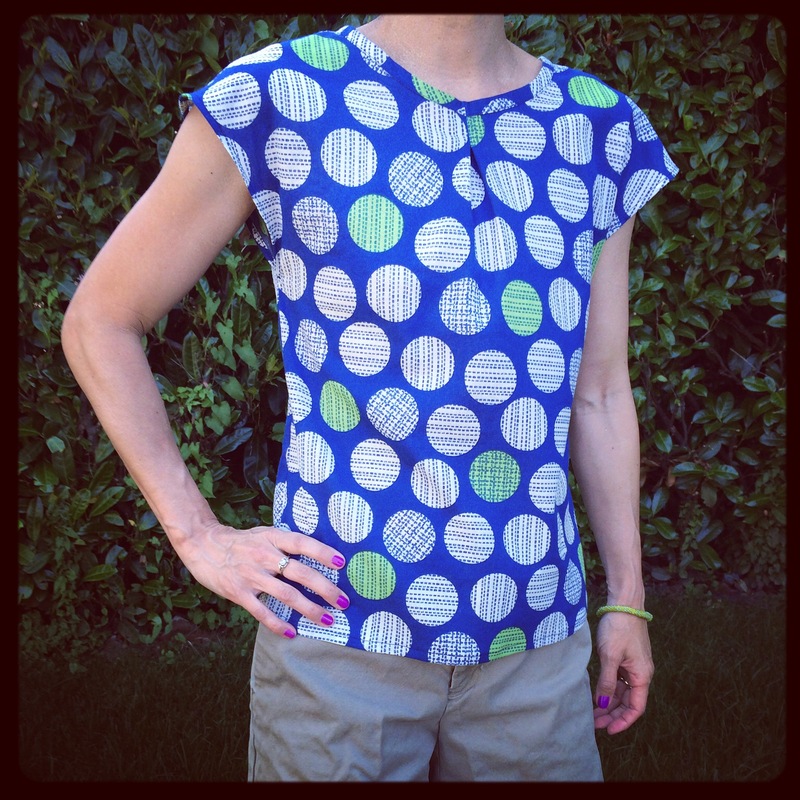 Thank you for sharing the project with the dot print, I am glad to see the blouse you made from it. As woven blouses are super useful in the hot summer, I’m sure you’d happy to have one more lovely blouse in hot pink too. I love this brown summer top! Reminds me of an iced latte.